Smithsonian Affiliations creates long-term relationships with museums and other educational organizations in order to fulfill the Smithsonian’s mission, “the increase and diffusion of knowledge,” and to advance the Smithsonian’s Strategic Plan. Smithsonian Affiliate organizations are key partners in exposing new audiences to the Smithsonian’s collections, educational programming, and research. Our work is guided by applicable laws, Institutional policies, codes and best practices of the museum field, and new initiatives established by the senior leadership of the Smithsonian. Before applying, or as a refresher, please review the detailed list of core policies and principles of the Smithsonian Affiliations program here. 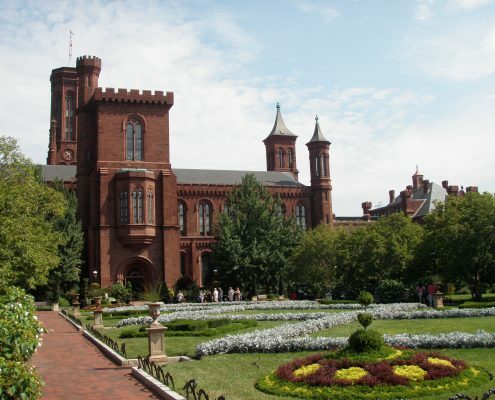 Completed in 1855, the Castle is the Smithsonian’s signature building and home to the Smithsonian Visitor Center.